Epainette Moerane (Ma Mofokeng Clan Name) Meets Govan Mbeki at Taylor Street Secondary School. Govan Mbeki receives a telegram about a job offer from the Clakesburg Institute, a Teacher Training College in Transkei. Govan Mbeki publishes "Transkei in the Making" a work of political analysis which is deeply critical of the system of local government in the Transkei. January 4, Govan Mbeki marries Ma Mofokeng. Govan and Ma Mofokeng have their first-born child Linda. June 18, Thabo Mvuyelwa Mbeki is born in Idutywa district in the Transkei.Thabo is the second child of Govan Mbeki and Ma Mofokeng. Govan Mbeki and Ma Mofokeng give birth to their third born child Moeletsi. Govan Mbeki supports the Mineworkers’ Strike in Johannesburg by collecting cash for victims injured after a heavy crackdown by the police. Govan Mbeki and Ma Mofokeng have their fourth child Jama. Fire destroys Thabo Mbeki's kraal and family shop. Photographs, books and family records are destroyed in the process. This forces his father, Govan to migrate to Johannesburg in search of work opportunities in order to provide for his family. Thabo Mbeki Joins the African National Congress Youth League (ANCYL) at the age of 14. At the age 16 Thabo Mbeki has a baby boy out of wedlock with Olive Mpahlwa named Monwabise Kwanda. Thabo Mbeki's schooling is interrupted by a student strike and completes his studies at home. Thabo Mbeki writes his matriculation examination at St John's High School in Umtata. Thabo Mbeki completes his British "A" level examinations in England. Thabo Mbeki meets Nelson Mandela in Mayfair, Johannesburg. Mandela briefs Thabo about his imminent departure to go and further his education outside South Africa with less disruption. Mandela and other high ranking officials from ANC and South Africa Communist Party (SACP) are of the view that it is in the best interest of Thabo to leave the country as soon as possible, since his life will be in danger due to his association with the two organisations. December, Thabo Mbeki is elected secretary of African Students Association (ASA). December 16, Govan Mbeki and other underground South African Communist Party and African national Congress members are involved in the establishing of uMkhonto we Sizwe (MK), the Spear of the Nation. Thabo Mbeki with his so-called football team are spotted by the South African police on their way to Botswana and are forced to return to South Africa. The team only made it as far as Zeerust in Limpopo. Thabo Mbeki and his football team on their second attempts make it to Botswana. However they are arrested in Bulawayo Zimbabwe. The Zimbabwean authorities want to hand them to the South Africa Government for leaving the country without the necessary documentations. They are saved from this situation by a helpful court clerk Cyril Ndebele and strong arguments from Thabo. January 4, Thabo Mbeki's first article as the New Organising Secretary of the African Students' Organisation appears in the newspaper "New Age". November, Thabo Mbeki lands in Tanganyika with a group of 28 students. They leave the country to further their education. Among the students is Manto Msimang -Tshabalala. Govan Mbeki and other members of MK’s high command are arrested in a police raid on Lilliesleaf farm in Rivonia near Johannesburg. June, Thabo Mbeki enrolls Sussex University. April 13, Thabo Mbeki reads a statement in London before a delegation of the United Nations Special Committee against apartheid. The statement is directed at the Apartheid Government in South Africa concerning the Rivonia Trial. Thabo Mbeki completes a Masters Degree in Economics at Sussex University in England. Thabo Mbeki starts to work full-time together with Communist Party leader Yusuf Dadoo at African National Congress offices in London. Thabo Mbeki arrives in Moscow and attends at the Institute of Social science. Thabo Mbeki is sent to Soviet Union for political training. Walter Sisulu and Abertina Sisulu's son Max joins Thabo, and together they make their way to a remote military camp near a town called Sekhodia. Thabo Mbeki is transferred to Lusaka, Zambia. Thabo Mbeki is in Botswana having talks with the Botswana Government about the opening of the ANC offices. Thabo Mbeki begins training South African Students escaping from South Africa to join the ANC in exile. After training them they are sent to African National Congress camps in Mozambique and Zambia. November 23, Thabo Mbeki marries Zanele Dlamini in London. Thabo Mbeki is appointed acting ANC’s representative in Swaziland. Thabo Mbeki is appointed to the National Executive of the ANC. Thabo Mbeki is appointed acting Chief representative of the ANC in Swaziland. Thabo Mbeki together with Jacob Zuma and Albert Dlhomo are arrested in Swaziland and after vigorous resistance to their impending deportation to South Africa are detained. May, Thabo Mbeki is asked to leave Swaziland as the South African Government applies pressure on the Swazi Government to have Thabo arrested. December, Thabo Mbeki is appointed Chief Representative of the ANC in Nigeria. The American Television Channel, CBS, interviews Thabo Mbeki age 36 on the South African political situation and apartheid. Mbeki concedes to the possibility that the ANC is prepared arm struggle and is prepared to negotiate for a peaceful transition of a democratic elected government in South Africa. February, Thabo Mbeki delivers a speech at the Seminar held in Ottawa in Canada about the historical injustice in South Africa. Thabo Mbeki is recalled into the political mainstream at ANC headquarters in Lusaka. He is appointed as Oliver Tambo's political secretary and Director of Information. 27 December, Thabo Mbeki is elected a member of Politico-Military Strategy Commission (PMSC), to consider new strategies options of the ANC. The commission is under the leadership of Oliver Tambo. March, Thabo Mbeki gives recommendations to the Politico-Military Strategy Commission that political cause should be followed rather than the military ones. Thabo is in favour of negotiating with the South African government. Thabo Mbeki is appointed the ANC’s' Director of Information. Thabo Mbeki addresses students at the Solomon Mahlangu Freedom College (SOMAFCO), the ANC's school in Tanzania. Thabo Mbeki's son Monwabise Kwanda disappears allegedly going to exile to look for his father. Kwanda disappears with Thabo's youngest brother Jama. 8 January, A speech drafted by Thabo Mbeki is broadcast on numerous radio stations and Television, calling for the formation of the united front against apartheid. Thabo Mbeki is appointed head of the ANC's Department of Information and Publicity. Thabo Mbeki meets a group of several important White businessmen led by Anglo American chairman Gavin Relly at an isolated game lodge in Mfumbe, Zambia. Thabo Mbeki is re-elected to the National Executive Council of the ANC as Secretary for Presidential Affairs. June, Thabo Mbeki drafts a new basic strategy document aimed at taking the ANC into the next and it is hoped, the final phase of the struggle. Thabo Mbeki is dispatched by Oliver Tambo to represent the ANC at a conference hosted by the Ford Foundation in Long Island. New York. Thabo Mbeki has dinner for the first time with an Afrikaner Woman, Christine De Lange. The South African Government dispatches an assassin to Lusaka in Zambia to assassinate Thabo Mbeki by bombing his house. The plan is unsuccessful as the assassin is spotted and arrested by the Zambian authorities. Thabo Mbeki heads an ANC delegation to a meeting in Dakar Senegal to meet with a delegation from Institute for a Democratic Alternative for South Africa (IDASA). August, Thabo Mbeki attends a conference in Dakar, Senegal with a group of more than 50 Afrikaner intellectuals. Thabo Mbeki travels to Moscow in Russia with Chris Hani for a short holiday. Thabo predicts to Vladmir Shubin, an expert on Southern Africa, that he will return to South Africa in 1990. Thabo Mbeki addresses demonstrators outside the South African Embassy in London. The demonstrators call for the banning of Apartheid in South Africa. Thabo Mbeki is appointed as head of the ANC’s Department of International Affairs. Thabo Mbeki meets his father Govan Mbeki in Lusaka Zambia after 30 years of separation. The only memory of his father Thabo remembers is the letter he received on his graduation day at Sussex University in England encouraging him to do his doctorate which he never bothered to respond and in 1974 on his wedding. Thabo Mbeki calls Pollsmoor Prison and speaks to Nelson Mandela for the first time since his arrest. 21 August, Thabo Mbeki lobbies successfully for African governments to adopt the Harare declaration. The Harare declaration contains the first real vision of a transition to democracy in South Africa. It calls for the unconditional release of all political prisoners and the unbanning of all political organisations. September, Thabo Mbeki addresses the anti-apartheid activists in Switzerland. Thabo Mbeki and Jacob Zuma are appointed to lead the ANC in Operation Flair which meets members of the South African government for the first time in 20 years after the banning of the ANC. October, In a speech made to the Southern Africa Coalition in London, Thabo Mbeki calls for sanctions against South Africa in order to help end apartheid and a transition of a democratic elected government. 8 November, Thabo Mbeki issues a statement at the General Assembly of the United Nations about the need to give full cooperation and support to the Special Committee against apartheid so that they can speed up their work on South Africa. Thabo Mbeki persuades the ANC to give up the armed struggle against the apartheid regime. Thabo believes guns will not grant them freedom but negotiating will. 27 April, Thabo Mbeki officially returns to South Africa from exile after the unbanning of all political organisations. He arrives in a personal plane of Zambian President Kenneth Kaunda. 2 May, Thabo Mbeki leads the Lusaka delegation for a meeting at Groote Schuur which results in the signing of the Groote Schuur Peace Accord. 5 December, Thabo Mbeki addresses the General Assembly of the United Nations thanking them for putting pressure on south Africa by declaring that apartheid is crime against humanity. Thabo Mbeki is accused by Bantu Holomisa of having his fiftieth birthday party paid or sponsored by hotel magnate Sol Kerzner. 18 November, Thabo Mbeki addresses the United Nations General Assembly on behalf of the ANC about South Africa and the way forward on change. Thabo Mbeki is elected Chairman of the ANC. 13 December, Thabo Mbeki addresses the General assembly of the United Nations on the theme titled "Elimination of Apartheid and Establishment of a United, Democratic and Non-Racial South Africa". African National Youth League endorses Thabo Mbeki for the Deputy President position of the ANC. 10 May, Thabo Mbeki is sworn in as the Deputy President in the New Government headed by Nelson Mandela. 16 June, Thabo Mbeki becomes the Deputy President of the Republic of South Africa of the New Government of National Unity. December, Thabo Mbeki is appointed Deputy President of the African National Congress. Thabo Mbeki sacks Winnie Mandela from her Deputy Ministerial position for refusing to listen to commands of the party executive and abusing her ministerial privileges. Thabo requests his co-deputy president, F.W de Klerk who is the head of the cabinet Committee on intelligence to investigate Tokyo Sexwale on allegations of drug trafficking. 26 February, Thabo Mbeki unveils the Growth, Employment and Redistribution (GEAR) economic policy, an ambitious blueprint aimed at stimulating South Africa's economy to 6 per cent as well as creating 500 000 desperately needed new jobs. May 8, Deputy President Thabo Mbeki reads a statement on behalf of the ANC, on the adoption of the Republic of South Africa Constitution Bill 1996, by the constitutional Assembly. 10 June, Thabo delivers a speech at the National Assembly during the debate on budget vote no.2. 12 December, Thabo Mbeki speaks at a conference before the ANC's 50th National Conference, addressing the issue of possible changes to the policy after the departure of Nelson Mandela from public office. 18 December, Thabo Mbeki is elected the President of the African National Congress during the party's 50th conference. 20 December, Thabo addresses an ANC conference at Mafikeng Stadium. Thabo Mbeki agrees to a National Party request that National reconciliation or nation- building needs to be debated in the National Assembly. Thabo Mbeki receives news from the members of the Mpumalanga provincial Executive Committee alleging that Mathews Phosa is enriching himself and involved in corruption. 9 April, Thabo Mbeki delivers a speech at the United Nations University, Tokyo, Japan. The Speech is on African Renaissance, South Africa and the World. 26 December, Thabo Mbeki is home for Christmas festive. A historic African feast is carried out in his honour as it is like home coming of a prodigal son who left in 1959, two bulls and 20 merino sheep are slaughtered. Nelson Mandela and half of the National Cabinet Ministers attends the occasion. 3 June, Thabo Mbeki issues a statement on the ANC’s election victory. 14 June Thabo Mbeki is elected president of South Africa. 16 June, Thabo Mbeki is inaugurated as the second democratic elected president of South Africa after Nelson Mandela. 27 August, Thabo Mbeki addresses the Afrikaanse Taal en Kultuurverenining (AKTV). 17 September, Thabo Mbeki is awarded an Honorary Doctorate from Rand Afrikaans University. 11 October, Thabo Mbeki gives a speech at the launch of the African Renaissance Institute. 3 April, Thabo Mbeki write a letter to world leaders regarding South Africa's position on HIV-AIDS. Mbeki does not share the belief that HIV causes AIDS, a statement which causes an outcry amongst Medical Practitioners and AIDS sufferers in South Africa. 19 May, Thabo Mbeki is awarded Honorary Doctorate of laws from Glasgow University Caledonian University. 24 May, Thabo Mbeki receives the Oliver Tambo/ Johnny Makatini Freedom Award. 9 July, Thabo Mbeki delivers a speech at the 13th International Aids Conference held in Durban. 22 August, Thabo Mbeki receives the Newsmaker of the year award from Pretoria News Press Association. 6 August, Thabo is congratulated by Keneth Ross, the Executive Director of Human Rights Watch Movement in the United States of America for his leadership role in the New Partnership for Africa development (NEPAD). December, Thabo Mbeki awards the first of South Africa's newly conceived National Orders-theOrder of Mapungubwe, the Order of the Baobab, and the Order of the companions of O.R.Tambo-redesigned to reflect the inclusiveness and diversity of South Africa. 17 December, Thabo Mbeki is re-elected President of the African National Congress. 23 August, Thabo Mbeki honours United Democratic Front (UDF) heroes. 15 October, Thabo Mbeki arrives in India for Hindu celebration and to discuss bilateral trade with India. 13 November, The Landless People's Movement of South Africa issues a memorandum directed to Thabo Mbeki criticising his government's general treatment of landless people and forced removals of million people from their homes. December, Thabo Mbeki awards the Order of Luthuli, the Order of Ikhamanga, the Mendi Decoration for Bravery, the Order of the Baobab, the Order of Mapungubwe, and the Order of the companions of O.R.Tambo to 42 South Africans. 6 February, Thabo Mbeki's state of the Nation address. He reports on the 10 years of democracy since the end of apartheid in 1994 on what has or has not been achieved. 10 February, Thabo Mbeki announces that 14 April 2004 will be the date for South African's third democratic election. 4 March, Thabo Mbeki addresses the 23rd Africa Regional conference of the Food and Agriculture Organisation: Sandton Convention Centre, Johannesburg. 7 March, In his election campaign in Mpumalanga, Thabo Mbeki dismisses the idea that he is seeking a third term as the President of the country. 11 March, Thabo Mbeki is asked by the officials from Equatorial Guinea to help in a trial of suspected Coup plotters. 14 April, Thabo Mbeki casts his election vote at the Colby Park Polling Station in Pretoria. 27 April, Thabo Mbeki is inaugurated for a second term as president of South Africa on the same day the country celebrates its 10th anniversary as a democratic state. April, Mbeki visits Singapore to strengthen bilateral trade relations between the countries. April, Thabo Mbeki appoints the Khampepe Commission of Inquiry to look into the location and mandate of the Directorate for Special Operations (DSO). 14 June, Thabo Mbeki dismisses Jacob Zuma as deputy president on allegations of corruption arising out of the arms deal. 22 June, Thabo Mbeki appoints Phumzile Mlambo-Ngcuka as the deputy president of the country. She becomes the first woman to hold the post of deputy president. 30 June, Thabo Mbeki gives his opening address to the National General Council meeting. 11 November, Mbeki visits Defence Minister Mosiuoa Lekota at Gatesville Medical Centre after he suffered a mild heart attack. 8 August, Mbeki dismisses Nozizwe Madlala Routledge from her position as the Deputy Minister of Health. 16-20 December, Thabo Mbeki loses the ANC presidential election to Jacob Zuma at the ANC’s 52nd National Conference held in Polokwane. 08 September, Mbeki and his facilitation team visits Zimbabwe in his capacity as the facilitator in the ongoing SADC mandated facilitation work. 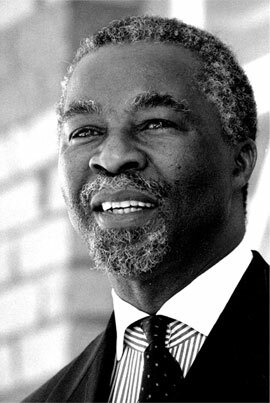 21 September, Thabo Mbeki steps down as president of the South Africa and addresses the nation. March, The African Union (AU) appoints Thabo Mbeki to head a committee tasked with investigating human rights violations in Darfur. October, The Thabo Mbeki African Leadership Institute (TMALI) is launched at the Sandton Convention Centre in Johannesburg. December, Mbeki is appointed by AU to mediate in the electoral standoff in the Ivory Coast. Mbeki visits the country to holds talks with rival parties, President Laurent Gbagbo and opposition leader Alassane Ouattara. April, Officials in South Sudan call for the removal of Thabo Mbeki as the mediator in the ongoing African Union efforts to resolve the conflict between Sudan and South Sudan.